Tourists visit St. Petersburg in general because of the rich history and culture. The city is old and full of wonderful heritage buildings dated back since centuries ago. Walking down to the street of St. Petersburg, tourists will feel like they’re transported to another era. The architecture of St Petersburg is a top notch. The most popular probably is the winter palace. There are a lot more buildings and cathedrals to explore. And besides the architecture, there are plenty of other reasons why you should visit St. Petersburg. For visitors, after admiring the wonderful architecture of the city and discover some unique things here, they might want to do some shopping. Once being a capital of Russian Empire, St. Petersburg is no stranger of being Russia’s economy center. And it is as well in modern days. Retail and commerce are thriving in this city. Shops and department stores can be found in this big city. It is not only Moscow that is good for shopping. Shopping is available for everyone regardless of their budget. But some of you might want to go for branded stuff only. For visitors who want to experience luxury shopping, here are 8 branded shopping center in St. Petersburg. Department store DLT is where you can find plenty of international brands in one place. It has the best selection of 700, definitely a heaven for shopping addicts. Among the brands are Alexander McQueen, Ralph Lauren, Dolce and Gabbana, and Burberry. There are still hundreds more to explore! Apart from fashion, DLT offers a range of exceptionally made souvenirs with good quality. This is where shoppers find handmade matryoshka created by skillful craftsmen. Other souvenirs including amber glass boxes and jewelry. So buy some for the loved ones at home. So grab one and you’ll be sure that the item will last for a long time. The perks of shopping don’t stop here. DLT now offer tax return for several kinds of purchases. Among those purchases are for apparel, shoes, and other fashion items. BABOCHKA established in 1988, still relatively new. It is a haven for luxury shoppers looking for a way to spend their money. It is definitely one of the 8 Branded Shopping Center in St. Petersburg to choose from. The French luxury brand, Chanel, opened a store in St. Petersburg. the store Located specifically in the picturesque and historical Nevsky Prospect. This popular brand has fans and loyal buyers from all around the world, St. Petersburg included. For Chanel fans who happen to crave a Chanel finery while they’re traveling to this city, thankfully there’s a store that will help to fulfill that craving. Going to the boutique will be a good choice. Grand Palace Boutique located in the center of the city in Nevsky avenue. It is a very nice shopping center and looks gorgeous from the inside. As shoppers come inside The luxurious atmosphere can be felt almost instantly. They offer international brands as well as some local. There are many other attractions too beside shopping. For example, cinema, and restaurants. If you bring your kids, there’s also a children area for kids to play, and then you can concentrate to go shopping. built in 1905 and is 111 years old in 2018. it is also the first department store who has many floors in Russia. Shopping here is both a spree and also a history lesson. It is a historic building beside just a shopping mall. Au Pont Rouge is named after the red bridge (Krasny Most) that is located just beside the building. It is beautiful from the outside and the interior is designed with the art nouveau style. The interior will make you even sure that the shops here are only for rich customers. The products are top notch and displayed beautifully. Even if you’re just looking or window shopping, you’ll still have a good time here. It was the shopping center for royals and nobility back in the day. Au Pont Rouge offers the most luxurious goods for the aristocracy. Nowadays, the store host unique and distinctive brands such as Carven and AMI. Shoppers will find the collection refreshing and interesting. Au Pont Rouge also has great cosmetics selection. The first floor has many French style coffee shops. Some other luxury brands, besides Chanel, who have their own store are Luis Vuitton and Prada. Like Chanel, Louis Vuitton is a popular French brand that also has successfully made their way into Russian fashion lovers. While Prada, an Italian brand, also capturing the heart of Russian fashionistas as well. Both Louis Vuitton and Prada have stores are located on Bolshaya Konyushennaya. You can shop here if you’re a fan of those two brands. Also, individual stores provide nice alternatives for shoppers who don’t want to explore the whole shopping mall. Well, shopping can get tiring. For those who want to shops with a Russian taste, nothing wrong to try local designers. Boutiques of local designers such as Iya Yots and Ianis Chamalidy can be found along Bolshoy Prospekt. For a one-stop department stores offers dozens of local designers brand, head for Bolshoi84. Bolshoi84 also located on Bolshoy Prospekt. This is where shoppers can find 15 and more local brands and some of the international brands. Another famous local designer of Russia is Tatyana Parfionova. She has a unique taste and she likes to incorporate Russian elements into each of her design. 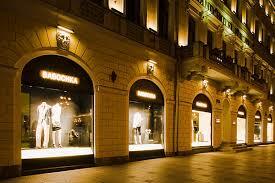 If you want to see her collection, Tayana Parfionova owns a fashion house on Nevsky Prospect, St. Petersburg. Tatyana is also active in showcasing her new collection in Russia Fashion Week. Faberge is one of the most refined jewelry houses in Russia, if not in the world. This is where pieces of jewelry crafted for the emperor (Tsar) of Russia in old time. Although now it has become a museum, Faberge Museum is still a good choice for window shopping. visitors can discover thousands of priceless jewelry and artworks here. Among those pieces of jewelry, there are easter eggs that once belonged to the royal family! So those are the highlights of 8 Branded shopping center in St. Petersburg. The list is useful for everyone looking to experience luxury shopping. It is also for those who love branded products and discover some local luxury items. St. Petersburg is definitely a shopping heaven.